« Newly diagnosed? Read Jennifer’s advice – from Every Day Ups and Downs, a Diabetes Blog. Roche Accu-Chek New Mobile BG Meter – Review. Roche Accu-Chek New Mobile BG Meter. I thought it was about time I wrote a Blog review of my Roche Accu-Chek Mobile which I have been using for a fair few months now after speaking to the team at Roche who as ever are more than happy to help. I particularly like the fact they have a large range of meters to suit most tastes and requirements. The meter I have been using is the latest version and somewhat slimmer than the previous version which certainly appeals to me, it certainly looks the part, I even like the packaging lol. I called the Customer Service Team to ask if it was possible to send me a meter and the team took some details from me so I was registered for replacement batteries etc and within a day or so my lovely meter arrived, with a cartridge of test strips in the box. I had also ordered a new carry case to keep my lovely new meter safe and clean which looked great and protected the Accu-Chek Mobile perfectly. It is ideal for going out and popping in your pocket but it is not the smallest meter however on the flipside of this the screen is great and I have seen larger BG meters. For me the fact you have a cassette of 50 strips in the meter and the lancet also has 5 finger sticks included you do not need to worry about taking anything else out with you, I will get to the technical details soon. I must say this is one of the best meters I have tried but each manufacturers BG meter has its own merits and will appeal to different people with Diabetes, I like a large clear backlit screen due to my poor eyesight, however some people with Diabetes want a tiny meter to fit in their pocket or even meters that check their ketones – technology for us is changing fast. 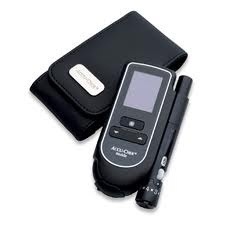 The NEW Strip Free Accu-Chek® Mobile Blood Glucose Meter System. 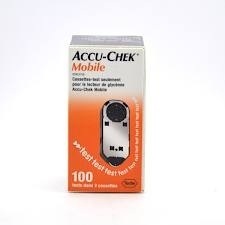 The new Strip Free Accu-Chek Mobile system with 50 tests in one cassette eliminates the need to handle or dispose of single test strips. This makes it easier for you to test virtually whenever, wherever. It includes everything that is needed to perform a test making blood glucose monitoring more convenient, especially for insulin-using people with diabetes. All-in-one system: test whenever, wherever. 50 tests in one cassette: no more strips. 4 simple steps: fast, easy testing. ** Please click on the “View Product Details” link above for more in depth info. As with all BG meters out in the market now they all seem to provide very accurate results in literally seconds compared to when I was first diagnosed and had to wee on a colour changing stick – nice I know J.